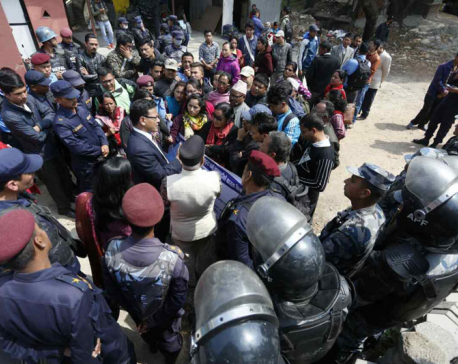 DAILEKH, June 7: Many conflict victims in Dailkeh district whose family members were killed, injured or made to disappear during the insurgency era are yet to file complaints at the Truth and Reconciliation Committee (TRC). They have cited threats from their perpetrator as the main reason for not lodging complaints. The district has received about 5,000 applications from conflict victims for internal relief. However, only 273 victims so far have lodged complaints pertaining to various human rights violation during the insurgency period through the local peace committee. One of the conflict victims, citing animosity, claimed to have received warning not to file complaint. "How can I file complaint in such situation? I lost my relative to the insurgency. Now I do not want to risk my life by filing complaint," said the victim. In an interaction program, victims opened up to human rights activists who came to monitor complaint filing process at the TRC in the distinct. Apart from threats from perpetrators, they also complained about lack of secrecy at the local peace committee. "The complaint filing process hardly offers us any secrecy. We also do not feel secure at all," said Yam Prasad Pandey, one of the conflict victims. Another conflict victim, Avisara Adhikari said that she was forced to fill up her form collectively with other victims. "I did not feel secure. Where is privacy for us?" she asked. Likewise, she also complained that employees at the peace committee did not provide assistance when asked for it. "I asked for assistance as I found it difficult to fill up the form. But none of the employees bothered to help me." Adhikari's husband was made to disappear from Jamunaha Police Post. Army personnel also had tortured her. Stating that the country's laws regarding the disappeared are not strong, she expressed feeble hopes of actually receiving justice. "The government is finally taking our complaints after ten years! How much longer do we have to wait to receive justice?" she questioned. According to the local peace committee, they have not received a single complaint from some conflict-affected places of the district, including Kalika and Naumule. The council also stated that lack of awareness have also contributed to fewer number of complaints.